Bottle warmers are used to thaw out frozen or cold milk efficiently. They can also be used as a baby food warmer. Of course you can always just heat up water in a pot and thaw your milk out in the pot of water. But that requires constantly checking and monitoring the temperature of the milk to make sure you don’t over thaw your milk. It is quite a time consuming process – usually a good 15 minutes of work. This is why the bottle warmer was invented: to give people a hands off quick solution to warming up milk or food. By using a bottle warmer you can perfectly calibrate the optimal temperature you want your milk to be in the end, all in less than 5 minutes and a few touches of a button. It is also a much safer option than microwaving the milk, which requires a lot of guesswork and leave uneven patches. This convenience is definitely worth the minimal investment in price. With so many styles and varieties to choose from, it might be difficult task to pick the right one for your need. This article will help you make an informative decision on the best bottle warmer for your baby. We have tested out all of the bottle warmers available on the market and have come up with a top 3 list. 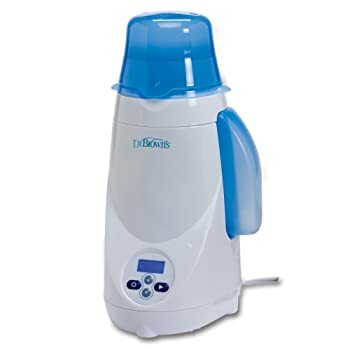 Some bottle warmers also come with the feature to sterilize baby bottles for future use, so if you are also looking for the best bottle sterilizer, there are definitely products that offer both services. Dr. Brown’s Bottle Warmer is certainly the most popular product on the market and is the best bottle warmer for its price. 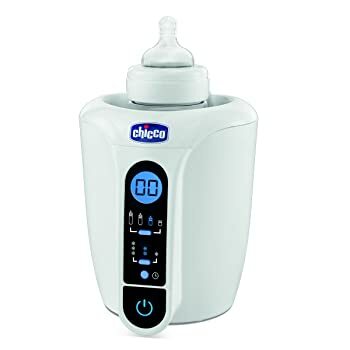 It is certainly one of the easiest bottle warmers to use: simply press a button and then go back to your crying baby. When the machines beeps, go back and like magic you have warm milk. Although Dr. Brown’s Bottle Warmer may not be the prettiest of bottle warmers, it has all the necessary functions. 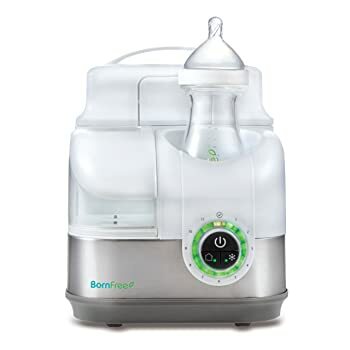 Some of the features include the following: a water compartment can warm several bottles before needing to be refilled, an alarm with flashing LCD to let you know when the milk is ready, a cycle memory that remembers past heating settings for different bottle sizes, and the proper dimensions to warm standard and wide baby bottles and food containers. You get all of this for such an affordable price, which makes it the best bottle warmer for value. Dr. Brown’s Bottle Warmer uses steam to warm the bottles. It works right out of the box and there’s no learning curve. You simply look at the table on the back of the product to find what type of bottle and the amount of fluid you have. The table gives heating times for every possible bottle configuration. You then press the up and down buttons to set the heating time and press play. The bottle warmer will count down to let you know how much remaining heating time you have left. Dr. Brown’s Bottle Warmer is such a life saver. If you heat your bottle in a hot water pot, you will have to make multiple trips to the kitchen during the night and have to consistently monitor the temperature. Dr. Brown’s Bottle Warmer is optimize to warm your bottle to the perfect temperature in less time and in a simple click on a button. We really like the fact that it is simple to use and cheap. If you want the best bottle warmer for value, we would recommend this product. This is a very compact bottle warmer making warming bottles easy and convenient. It’s not bulky, so it’s easy to store when not in use. It’s also easy to get access to the whole warmer to clean it in case it molds or there is minerals from water that deposits. It is large enough to fit most bottles and doesn’t have a cap so it can heat up any size bottle for babies really. You’ll know when the bottle or food is ready by the sound alert that goes off when it has warmed to the proper temperature. Fits most bottle styles and sizes thanks to the removable insert. You can select different sized feeding bottles or baby-food jars and set the starting temperature (ambient, fridge, freezer). The display and acoustic signals allow you to easily monitor the entire warm-up cycle. It also has a timer which you can set it to normal, that takes around five minutes to heat the milk. The Born Free Bottle Warmer is a really nice accessory to have when you are stressing out tendering for your baby. It is the best bottle warmer for those who want a fancy gadget and are willing to pay a bit more for it. At a premium price, the Born Free Bottle Warmer offers a premium product. Most lower end bottle warmers including Dr. Brown’s have problems calibrating to the right temperature and sometimes overheat your milk. They also don’t last as long. The Born Free Bottle Warmer fixes all of these problems and has some technology inside that will auto adjust the perfect amount of water to use to heat your milk. The Born Free Bottle Warmer is incredibly easy to fill. While some bottle warmers require you to pour the exact amount of water in each time you are warming, the Born Free system perfectly calibrates the exact amount of water needed. This way, you only need to fill the reserve tank with water once a day and the machine will automatically adjust. This saves a lot of time and headaches. The Born Free Bottle Warmer also has fancy engineering inside to closely monitor the temperature of the water and heat settings. You simply look up your bottle type on a table imprinted on the back and dial the knob on the front to that setting. You then press a button for either room temperature or refrigerated and the machine will automatically calculate warming times. The machine also comes with an insulated cooler and ice pack, so you can store two bottles for up to 8 hours. This is extremely useful as a portable device. You can bring this device on a trip and use it in a hotel, both as a fridge and a warmer. You can also bring this device in your baby’s room and prevent trips to the kitchen late at night.